Life without the ubiquitous car: unimaginable. Owning a car is a convenience. Every 33 seconds, that convenience is taken from a driver in the United States. Currently, the Department of Transportation's (DOT) National Highway Traffic Safety Administration (NHTSA) establishes implements and enforces vehicle antitheft regulations. The short view of it is, losing a car means not being able to drive to the store, run errands, or go to a friend's house. The long view is, for other people, losing their means of transportation would cost them their livelihood. In the movies, it always seems like the cars that would get stolen are the sports cars --- in that world, no one seems to take notice of the passenger car, or the kinds of cars everyone drives. This has created a false sense of security for a majority of car owners, thinking that their vehicles likely won't be targeted. Which simply isn't true --- according to the FBI's 2008 Uniform Crime Rate Report, more than 72% of all motor vehicles reported stolen are passenger cars. The problem isn't even isolated in any certain state. Truth is, it happens all over the country: in our backyards, garages and even in most parking lots. At times the thieves aren't even after the whole vehicle itself; sometimes they just take the parts which can be sold. Though it is true that anyone and any vehicle may be the target of vehicle theft, the NHTSA have released tips and methods to prevent you from becoming a victim. 40-50% of vehicle theft is due to driver error, which includes leaving vehicle doors unlocked and leaving keys in the ignition or on the seats. Preventing that is as simple as being careful and having a keychain! Some more vehicle theft prevention tips are leaving visual deterrents, such as steering wheel, brake and wheel locks and not parking in secluded/sketchy places. Always be vigilant. Be informed. 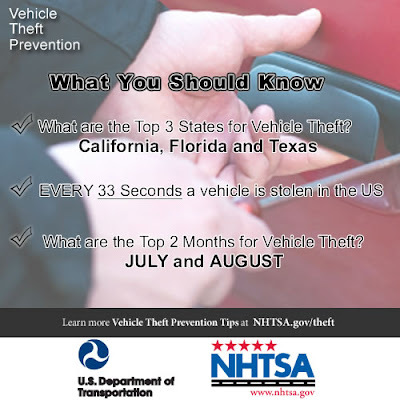 NHTSA has put up a great resource for vehicle theft prevention on their site that is worth looking into.